A world premiere, a CSO premiere and an audience favorite shared the Cincinnati Symphony program Saturday night at Music Hall. The threat of “snowpocalyse” having passed (while much of the east coast was buried in two feet or more of snow), a decent crowed was on hand to enjoy it. 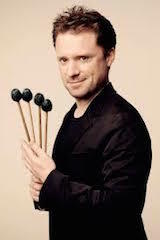 Guest artist in Wolfe’s concerto, a CSO premiere described as a “body concerto,” was percussionist Colin Currie in a dazzling display of virtuosity. Currie spent the first half of the concerto using his body as the instrument, variously rubbing his hands together, slapping his chest and thigh, stamping his feet and clapping his hands. This included a formidable “cadenza” with intricate finger snapping (and a long sigh). Currie – who chose jeans and a black t-shirt over formal dress -- moved to a percussion set to end the work, striking a metal plate, a pair of inverted jars and a tambourine. All of this was inspired, composer Wolfe writes, by American folk tradition and the “urban folk rhythms of the street” (as played by New York street musicians). The CSO served as a canvas behind Currie, accompanying him with foot tapping, pizzicato and glissandos. It made for an engrossing musical experience and was received enthusiastically by the audience. As an encore, Currie offered a rhythmically complex solo for snare drum. Macelaru, an impressive figure on the podium and one to watch (he was winner of the 2014 Solti Conducting Award and pursues a busy international career), introduced Schuller’s Triptych, a three-movement work analogous to a symphony. It was a world premiere and a fitting one, with Schuller (to whom the concert was dedicated) having begun his career in Cincinnati as principal horn of the CSO. In three continuous movements, it was a mix of styles, atonal with a hint of romance – there was a quote from Duke Ellington at one point – and extremely colorful. The horns stood in tribute at the end to the sound of tubular bells. Elgar’s “Enigma” Variations closed the concert beautifully, beginning with an oh-so-tender enunciation of the theme. Each variation was distinctly shaped, Macelaru coaxing the very best out of the CSO players. The viola variation (no. 6, “Ysobel”) was particularly lovely. There were beautiful solos by principal violist Christian Colberg, cellist Ilya Finkelshteyn and clarinetist Jonathan Gunn. The famous “Nimrod” variation (no. 9) began very softly and gently. Its big crescendo welled up perfectly, followed by an ethereal decrescendo. Textures were transparent throughout the work, and the organ-laced conclusion (Michael Chertock) was thrilling.